Simply cut off the lower bulb and remove the tough outer leaves. Most recipes call for the main (yellow) stalk, though some cooks reserve the upper green stem to add to soups and curries for extra flavor. The first (and easier) option if you are in a hurry or do not own a food processor, is to cut the yellow stalk into 2-3 inch lengths. Bend them several times and add to your soup or curry. You may also make very shallow cuts along the stalk with your knife, which will help release the lemon flavor. 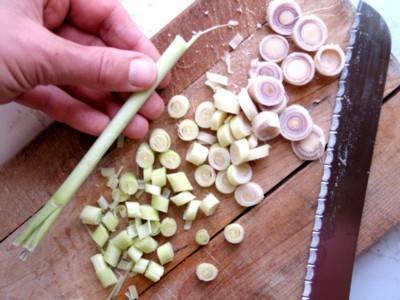 Lemon Grass is a stalky and fibrous herb and can be a bit “stringy”; be sure to remove the stalks before serving. Your second option is to slice the Lemon Grass into thin slices and pulse through a food processor before adding to your recipe. 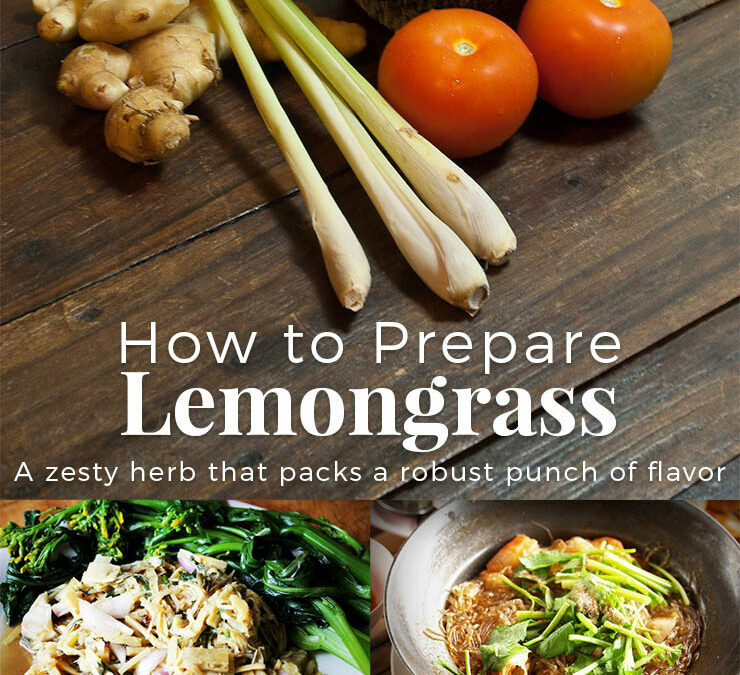 Prepare in this way if you are preparing the Lemon Grass to be consumed, adding fiber, nutrients, and more robust flavor. 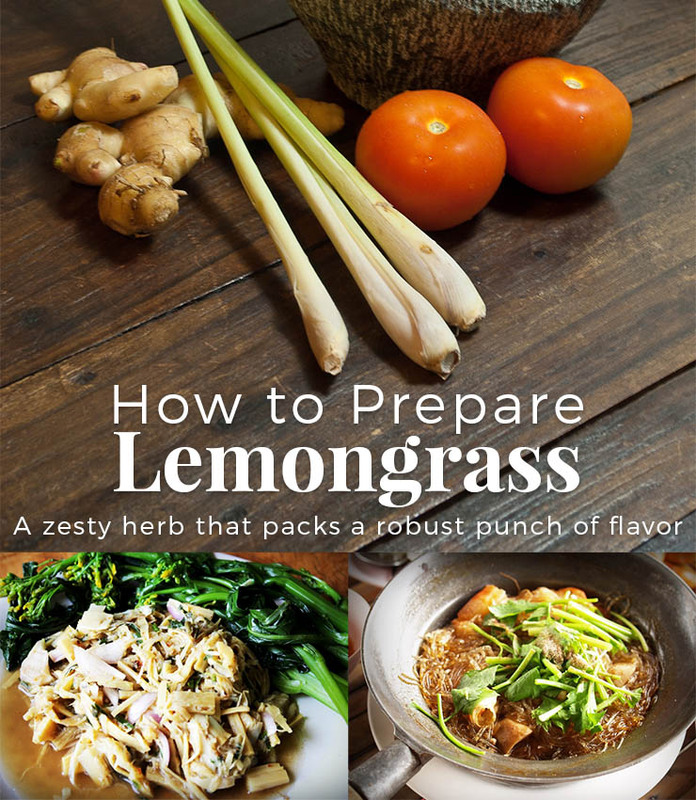 One of my Asian friends taught me to prepare lemongrass for soups. Take 3 0r 4 leaves(only the leaves) and wrap them in a ball (like yarn) tieing them off the grass itself. (You can also freeze them just like this or hang them to dry.) Cook in soup and remove before serving. (You may used the frozen or dried ones in the same way). I have a lemongrass plant but it does not look like the ones I am seeing on different web pages. There is no bulb. Mine looks like actual tall grass but with a nice lemon scent. It is tough and sort of scratchy. Is the an herb I can cook with? Can you send us a picture via Facebook (Facebook.com/The.Growers.Exchange) or email it to us at info@thegrowers-exchange.com and we’d love to help identify it! Can you put lemongrass in drinks. The simplest thing to get lemon grass plants is to visit your Asian market and buy the stalks. Just put them in water and change the water daily. In a week or 2 little roots will begin to emerge from the base. They emerge faster if you remove 1-2 layers of the outer stalk to expose the rooting area just above the bottom. When they are well rooted just plant just plant in loose soil and water daily and let run off until growing well. I trim the tops of the leaves every couple of weeks and make soup or tea while waiting for the plants to grow large. They like bright light and I grow them in a window in the winter and plant again outside in the springs after the frost has gone.